On this research voyage I am getting to help with seawater filtration. Each time the rosette of Niskin bottles goes down to different depths, they collect 144 liters of seawater at different depths, The processing I am doing is used to measure CHN for the elements carbon, hydrogen, and nitrogen, the basic elements of life. I take 2-Liter bottles of seawater and filter the water to concentrate the carbon, hydrogen, and nitrogen on filters about the size of a quarter coin. 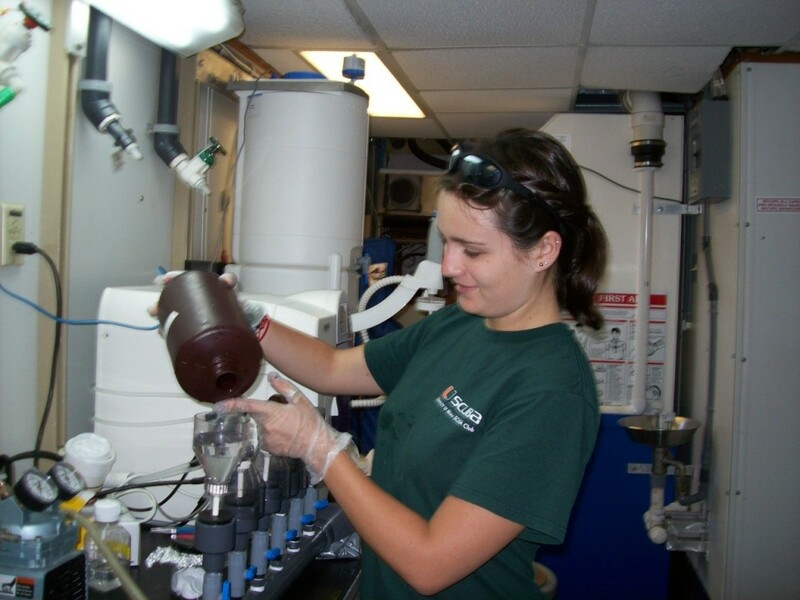 Other scientists are filtering seawater to collect particulate matter, chlorophyll a, and accessory pigments from phytoplankton for later analysis on shore using analytical tools like spectrophotometry and HPLC (High Pressure Liquid Chromatography). Some of the water is also tested for nutrients that are needed for phytoplankton to grow, somewhat like multivitamins. The weather has been beautiful, sunny, and cool this morning but hot this afternoon. We have finished most of the deep water sites (depths to 2300 meters. 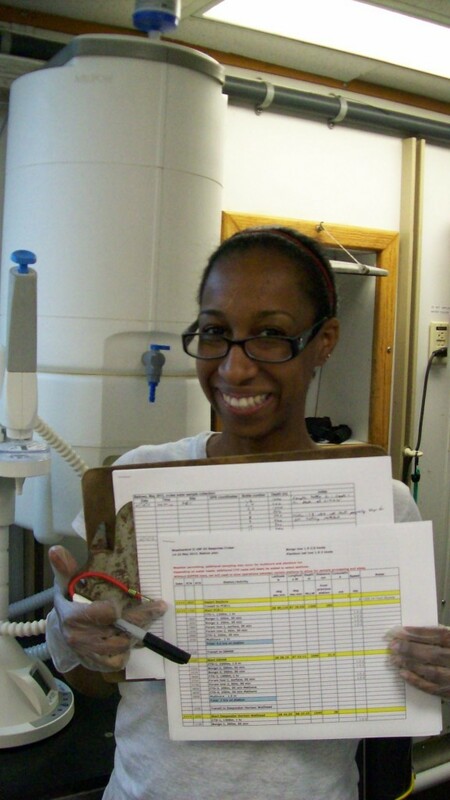 Sediment cores are hardest to retrieve from the deepest sites. Equipment and weather can easily interfere with successful collection of core samples. This expedition is on track for achieving all of its science goals. This is unusual on a research voyage, weather might interfere and delay or stop collection of seawater, plankton, or sediment samples or equipment could malfunction. 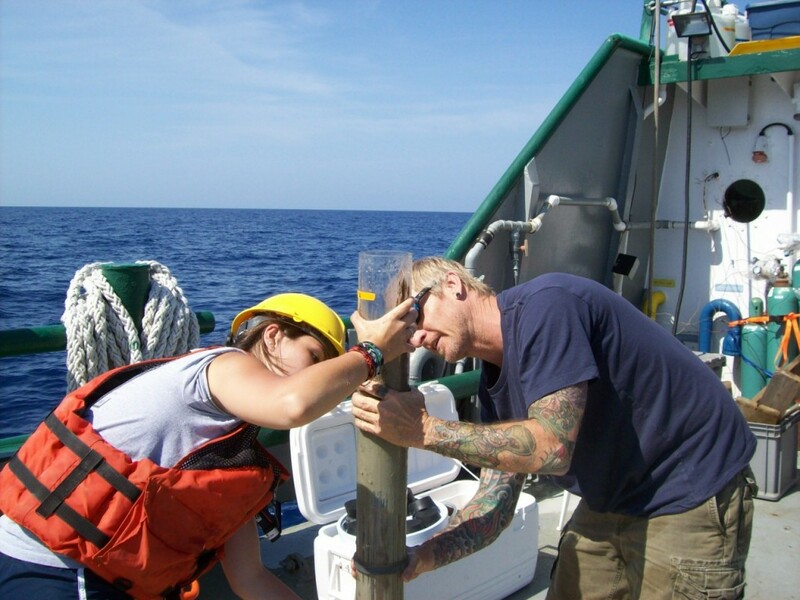 At one of the deepest sites, the sediment cores came back up with only water, but due to the good weather and several researchers needing data from the sediment samples the expedition was able to revisit that site to collect the sediment samples. Field science even in the sunny Gulf of Mexico doesn’t always work out that way, in fact it usually does not. This is also some of the equipment that is deployed (used) last at each sampling station. The sediments, at least those that I have seen collected have soft sediment layers. Some of it is muddy, has a silky texture and is softly workable with your fingers— like potters clay. The cores we are collecting don’t show a lot of layers but there is some evidence of activity stirring up the sediments as the worms and microbes and other small creatures feed and burrow (rework) in the sediments often recycling nutrients. Print article This entry was posted by greely on May 18, 2013 at 11:48 pm, and is filed under Oceanic Updates. Follow any responses to this post through RSS 2.0. You can leave a response or trackback from your own site.